Westporters watch steadily increasing traffic in Saugatuck. With plans for more development in the area, and possible modernization of the Cribari Bridge, we worry there’s more to come. Meanwhile, Waze and other apps contribute to clogged side streets everywhere, as commuters seek alternatives to the jammed-up Merritt Parkway, I-95 and Post Road. For years, Metro-North riders have been able to ease the hassle by taking shuttle buses to the train station. But many potential customers are unaware of routes or options. Others don’t even know they exist. The Westport Transit District has launched a marketing campaign to fix that. It involves emails, posters and route cards. It also includes the rollout of a new MyStop app. Users track shuttles in real time, so they can step out of their house moments before it arrives. MyStop is available in the iPhone and Android stores, or by clicking here. 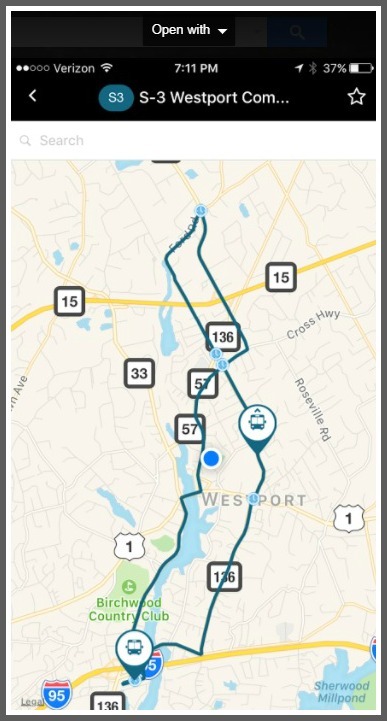 A screen shot of the myStop app shows Westport routes — and the location of the nearest shuttle. The email portion of the marketing campaign targets railroad parking permit holders, people on the wait list, and those on the Parks and Recreation list. Messages will be sent this coming week, with follow-up emails planned for early next year. The posters and cards — showing shuttle routes and other info — will be placed at the train stations, and throughout town. The campaign was developed by Westport advertising executive Rob Feakins. Jyoti Dasgupta added fresh designs. The Railroad Parking Division is assisting the Westport Transit District with the initiative. Look for the emails, posters and cards. Download the app. Try the shuttle. It won’t make all the traffic go away. But perhaps your trip to the train will be a little less miserable. This entry was posted in technology, Transportation and tagged myStop app, Westport Transit District. Bookmark the permalink. Glad to see that the Transit District has taken this step, something that Save Westport Now suggested during the survey. Hopefully the Transit District will now tackle some of the other obstacles to increased ridership, including revising the routes to make them more user friendly, setting up a pay-by-phone app, and making arrangements for off-hour commuters. I downloaded the app but can’t seem to find westport transit. Am I doing something wrong or looking for the right name? Hi Sally: The Westport Transit routes are listed under Norwalk Transit, which operates our shuttles. You will only need to choose Norwalk Transit the first time you use it. After that all Norwalk Transit and Westport Transit routes will automatically appear. Here’s a link to some specific instructions: http://www.westportct.gov/modules/showdocument.aspx?documentid=11294 There will also be a link to these instructions when the emails go out later in the week. Hope this helps. If not, I am happy to help in another way. Has there been any real improvement in high cost per rider – driven by low usage – despite these periodic ad campaigns? Last I heard, per-user cost was equivalent to leasing a new car for every single rider. Also has there been any study of the environmental impact of these diesel vans driving around nearly empty – and often left idling with a/c or heat running for the driver’s comfort? We know that diesel exhaust is inherently dirty and harmful to health, and I suspect these vans are not even of the most modern, cleanest diesel variety. This is good news. It’s a shame that year after year despite the constant efforts of the volunteers at the Transit District, the Marpe Administration has refused to provide funding to hire either a part time or full time employee to actively address our transportation needs and to enhance / expand / market this service. And to make matters worse the Board of Finance has forced the District to fight tooth and nail each budget season for the bare minimum needed just to keep the system in existence. Someone should truly track whether there is any meaningful additional ridership. Do people really give up rheir cars for a bus ride? Let’s see. If they are smart they will. Bus lanes. My wife & I have owned our home in Westport for almost a year & a half. We are early 30 something professionals that have utilized the WTD commuter shuttle since the week we moved to town. I need not list out all of Westport’s incredible attributes. However, the WTD commuter shuttle is a service that truly differentiated Westport for us relative to other towns. It makes moving a bit further up the New Haven line a little more palatable. It keeps cars off of the road during the rush. We have made friendships with our fellows Westport residents & the shuttle drivers that support us. The ridership on my route is consistently busy. Having said that, growth in ridership is something we would love to see (in addition to service expansion). Many that we meet at the station each morning have driven in from surrounding towns. We have yet to meet anyone on the shuttle who was not either a Westport resident, or commuting to a Westport job. This is uniquely a Westport service! Take advantage of it!